It is 12 miles from Tahquamenon Falls to Paradise. 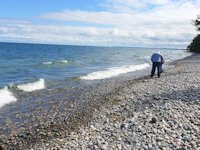 A worthwhile side trip is 11 miles north to Whitefish Point. 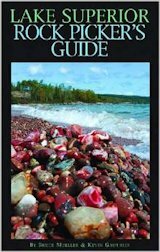 There you can tour the Lighthouse and shipwreck museum, walk the sand beach, watch for big ships heading to or from the Soo Locks, and visit the Whitefish Point bird observatory. Figure at least an hour for this side trip – more time if you do the formal tours. From Paradise take Hwy 123 South 11 miles to the intersection with South Shore Drive. There go east, running largely along the lakeshore of Whitefish Bay. After approximately 30 miles you will encounter Bay Mills Casino & Resort. There is an RV park here, a marina, hotel, dining and casino gaming. Although we were dissatisfed with our restaurant experience, a few years later we stayed at the RV Park and played their golf course and both were a positive experience. Both were good values and on the two occasions we have stayed there have had decent service at the RV Park and the Golf Course. After arriving in the community of Brimley, take 6 mile road east to I-75 that runs north into Sault Ste. Marie. 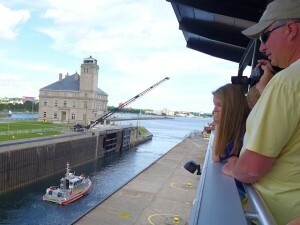 From the Soo Locks Viewing platform, you can view small and large ships (some 1000 feet long) passing through the locks between Lake Superior and Lake Huron. The Soo Locks Park where you can see the locks & get an up close view of the huge Lake Superior Freighters as they pass through the locks. If you are headed into Canada it would be wise to gas up on the Michigan side as US prices are generally better.